My Little Corner of the World: Book Blog 4: Witches! Summary: This book describes in vivid detail the events of the Salem Witch Trials. It begins with the accusations and a short history of how this community came to be and ends with the hangings and later reversal of charges against the accused. There are descriptions of each historical figure that took part in the trials from the accusers to the accused to the judges. The reader gains and in depth understanding of how this tragedy came to be and who the key players were. 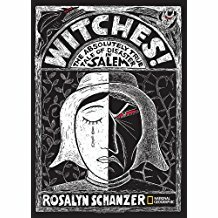 My Review: While I have read some fictional works about witches and even one or two about the Salem Witch Trials, I had no real idea what happened during that period or the extent of the damage. While this is a children's book and has definite appeal to children with its pictures and easy text, the subject matter was at times difficult for even me to read. I would recommend this for older kids or to be read alongside an adult so they can talk over the details. Overall, I really enjoyed the book and feel like I have a better understanding of the historical events. If a teacher were doing a study of this historic time, would you say that this book would be a good read-aloud book? I think they study this time period about 5th grade. I've seen this book, but haven't read it. I think this would be a great read-aloud for kids in 5th grade, though I wouldn't use it for younger than that because of some of the graphic details. You could also use this book to put on skits even because it includes some transcripts of the hearings and a listing of the characters. I think it could make an excellent resource for teachers. I read this book early in the semester and really enjoyed it! The graphic stuff didn't bug me so much, but I kind of knew what to expect going in, so that may have been part of it. I agree that it can be graphic and I'd definitely recommend it for older kids. It was particularly interesting for me at the time because my local summerstock theatre had recently done The Crucible. I noted in my own blog that I thought high schoolers studying the play might find this book useful for an easy-to-read historical companion to the fictionalized events presented in the play.